Parent's Choice Powder Fresh Baby Wipes are an essential item to have at your home with young kids. These wipes are plant based, ultra-strong, hypoallergenic and gentle on your child's skin. Use these in any sticky situation for a deep refreshing clean. They are most commonly used to change diapers and for washing sticky hands. 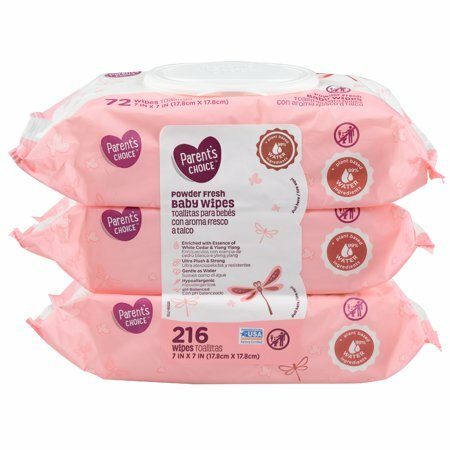 These wipes are packaged in bright pink wrapping that makes them easy to find in a diaper bag, and there are 216 total wipes so that you will have plenty of wipes in any situation. Go ahead and clean up the next mess with Parent's Choice Powder Fresh Baby Wipes. Since 1998, Walmart's Parent's Choice has been trusted by parents across the country to provide quality, affordable baby products. We offer a wide range of products including diapers, wipes, toiletries, baby food, formula and baby feeding products. With a quality guarantee to back up all its baby, toddler, infant and newborn products, Parent's Choice takes care of your little one’s needs for less. It has a nice, gentle fragrance, it's soft, size is good, comfortable on the skin and face, price is reasonable, perfect for traveling, always have one in my suitcase. I like it a lot. The quality of this wipe is amazing it's the thickest I've come to use. The baby powder scent is the best. I'm a special needs mom so my son is older and the smell is adult smell at times, with these wipes I've never had a problem with a soiled smell lingering on him after I've wiped him he just smells fresh as opposed to others that even though scented leave a smell no matter how good I wipe. We now use these also with our toddler. I used to use coupons to buy baby wipes didn't matter what brand I bought whatever was cheapest, until I tried these wipes. I'm a proud convert and never have minded paying full price. they are worth it and most times cost the same as if you used coupons. Only down side is they don't sell them in the bigger boxes. I really wish they would and it doesn't help that my local stores are almost always out of these I have to stock up on several 3count packs when they do have them that's how good they are. Great wipes, I was hesitant they wouldn't be good quality. 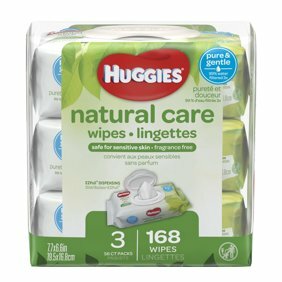 I've been using huggies natural care and wanted something affordable with a good scent and these were 100% what I was looking for. These are my favorite baby wipes ever. I honestly prefer them over Huggies and Pampers. The soft powder scent is awesome. They are thick and soft and get the job done. I have used these on all 4 of our children and have never had any rashes or irritation. I wish these were sold in bulk! My local store is frequently sold out of these, so I stock up when they are on the shelf. I was so excited when I found these wipes because they are far superior to other brands (generic and name brand). They have an awesome soft, baby powder smell (not overwhelming) and they are THICK. These are truly "one and done" even for BMs (unlike the Huggies brand). I wish these were sold in larger packages. You will not regret buying these! I was ordering Huggies wipes but after pulling a few out of the warmer, they would not pop up and I would have to open the warmer up. I tried Pampers wipes and while they popped up great wipe after wipe, they were not thick enough. On a whim, I tried these wipes and I will not buy any other wipe ever. They are thick like Huggies, but each one pops out of warmer with no problem. They smell fantastic, but not overwhelming. Walmart should stock more of these in store.